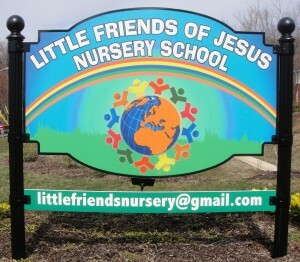 On October 11, 2009, a group of four Sisters, under the leadership of Sr. Romilda Borges, officially started another Vocationist Sisters’ community, and the Little Friends of Jesus Nursery School, both located at 1881 Washington Valley Road, Martinsville, New Jersey, in the Diocese of Metuchen. The convent and the nursery school for ninety-four children were built on 4.68 acres of land. The School is presently under the supervision of Sr. Romilda Borges, the Principal/Director. Both the convent and school were officially blessed and dedicated on November 8, 2009, by Most Reverend Paul Bootkoski, Bishop of Metuchen, and Most Reverend Edgar da Cunha, SDV, Auxiliary Bishop of Newark, New Jersey. The very good Sisters of Martinsville are actively serving the remarkable parish of the Blessed Sacrament in the Diocese of Metuchen. With great love for God and devotion to the teaching of Jesus, they teach CCD on Mondays and Thursdays, and on Sundays they play and sing for the Mass at 7:30 a.m.